Twas the night before Christmas .... and some of us weren't sleeping! 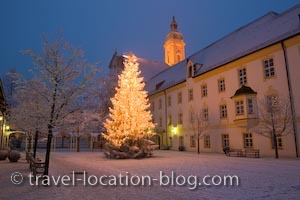 Rolf headed into Freising to capture the beautiful winter scenery Jack Frost had created. Landratsamt in Neustift, Freising, Germany. It's Christmas eve and all is quiet except for one little elf on a photo mission. Our very own Rolf heads out into the cold once again to capture Freising as a winter wonderland, while the rest of our stay cozy and warm indoors.